Random House Trade Paperbacks, 9780812979114, 224pp. The book’s subtitle is “A Memoir of Friendship.” Why it is not simply “A Memoir,” and what does this say about the book as a whole? Whose story, at heart, would you say this is? Caldwell writes, “Finding Caroline was like placing a personal ad for an imaginary friend, then having her show up at your door funnier and better than you had conceived.” She goes on to describe their “tatting center,” and the secret codes that tied their lives together. To what degree do you think the strength of a friendship depends on being able to disappear into an imaginary world together, to develop a secret code that only the friends understand? How do you see this playing out in Let’s Take the Long Way Home? What about in your own life? Gail and Caroline have a great deal in common, but they also have very different personalities. There is a darker edge to their friendship, too: Caldwell calls it a “swampland,” “the world of envy and rivalry and self-doubt,” the competitiveness between the two women in their writing, on the water, and in life. In what ways are they similar, and in what ways different? Do you think these elements strengthen or weaken their bond? Both Gail and Caroline have relationships with men, and yet the core of their friendship seems to contain a singular intimacy of the kind that exists between women. Does that bond call to mind friendships or relationships in your own life? In a scene on the Harvard University sports fields, Caldwell says, “We used to laugh that people with common sense or without dogs were somewhere in a warm restaurant, or traveling, or otherwise living the sort of life that all of us think, from time to time, that we ought to be living or at least desiring.” One of the things Gail and Caroline discuss in the course of their friendship is whether they are “living their lives correctly”—whether they are taking full advantage of the time they have. Do you think there is a “correct” way to live, and if so, what do you think should dictate the priorities? Is it realistic to try to avoid wasting time, or is that necessary to “correct living”? Do you think Let’s Take the Long Way Home offers any kind of answer to this question? “What they never tell you about grief is that missing someone is the simple part.” What do you think Caldwell means by this? As the author is struggling to overcome her alcoholism, she has two conversations that help change the way she sees the world and her experiences. In one, a therapist tells her that “If…I could keep only one thing about you, it would be your too-muchness.” Later, her alcoholism counselor, Rich, says, “Don’t you know? The flaw is the thing we love.” Do you agree? Can you think of examples, in the book or in your own life, that prove or disprove these ideas? 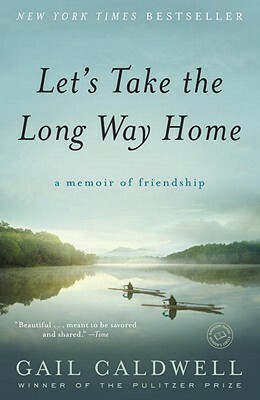 Let’s Take the Long Way Home doesn’t have a memoir’s traditional, chronological narrative structure. How do you think this contributes to the effect and emotional impact of the book overall? Does it reflect the nature of the friendship itself? Could Caldwell have told her story any other way? Do you see Gail, as a character, change in the course of the book—having discovered, and then lost, both Caroline and Clementine? What would you say she has gained? Caldwell tells a moving anecdote about using the “alpha roll” while she is training Clementine. It is a technique meant to establish the dog owner’s authority, but it doesn’t work at all on the mischievous puppy; as she continues to try and fail, Caldwell suddenly sees a parallel between her own childhood relationship with her father and senses that the whole approach is wrong. “From that moment on, everything changed between us. Wherever I danced, she followed.” What lessons might we all learn from this story? Loss is at the center of the book —we know from the first several pages that Caroline will die —and Caldwell writes about the new world without Caroline in it, where she experienced rage and despair and “the violence of time itself.” Does her description of grief mirror any of your own experiences? Caroline and Gail have a private game in which they assign a dog breed to each person they know. For fun, what kind of dog would you be? What about your best friend? Your worst enemy?